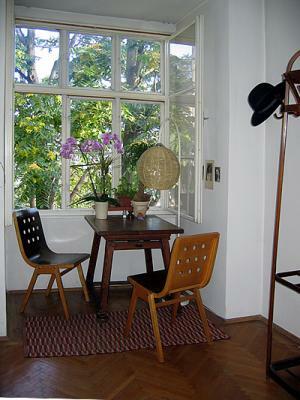 Beautifully furnished apartment in Biedermeier building. The apartment features a grand living room with antique furniture. The bedroom is adjacent to the living room and has a huge closet for your clothes. There is also an armoire and a dresser in the bedroom. Both are antique. The bed is queen size. Sheets and linens are provided for short rentals. We also have apartments in New York City. To see all the apartments, please go to NYC's Apartments.com.